Jaipur : India’s ‘Make in India’ initiative and mechanical engineering industry strives to apply cutting-edge technology, produce high-quality products up to international standards, and further participate in the global value chain. 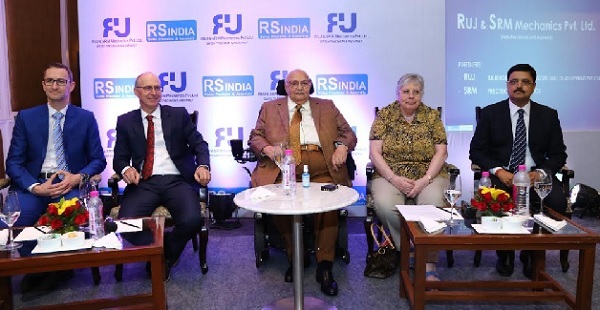 To make this initiative more meaningful and impactful, Switzerland-based Scientist Dr. Rajendra Joshi and his wife Ursula Joshi (RUJ Group) have set-up India’s first of its kind ‘Swiss Precision & Assembly’ unit in Jaipur, Rajasthan in joint venture of Switzerland based company. RUJ & SRM Mechanics (RS India) is the JV between Rajendra and Ursula Joshi Skill Development Pvt. Ltd. and a Swiss Company SRM Technologies AG. The mission of RS India is to provide best of the solutions to the manufacturing industry for their need of high precision metal parts with value addition of metal anodizing, painting and heat treatment etc. It aims to offer manufacturing solutions to the sectors like Health and Medical, Automotive, Polymechanical, Machine Automation, Laboratory Technology, Photo Technology and Aerospace, etc., where high precision parts play a crucial role for the end products. Father of Modern Skill Development in India, Dr. Rajendra Joshi, Chairman of RUJ Group said, "Various sectors witness a great demand of precision parts in India and despite the relatively high number of precision parts manufacturers, the sector is challenged by import reliance." He further added, "Investment in manufacturing of precision parts is essential to further develop and expand prime sectors of the economy, including the automotive, healthcare, logistics and electronic industries. Seeing the opportunity in India, we are offering the Swiss Precision & Assembly solutions with the world class plant equipped with international machineries and technology in India." This newly inaugurated Swiss precision and assembly plant will be initially furnishing orders received from SRM Technologies as their Switzerland facility is operating at its optimum production capacity and has 2 years orders pending in advance. Many globally acclaimed companies like SIEMENS, ROCHE, Schneider Electric, Sika, Leica, Audi, and Metalaire are regular clients of SRM Technologies in Switzerland. Now in India, with the same excellence, the newly constructed plant will be also manufacturing precision parts for the same companies and exporting as per the orders. While, Switzerland based, Peter Strebel, CEO of SRM Technologies AG, said, “The competition among the developing countries is becoming fiercer and Indian producers are disadvantaged by recent economic gains that have driven up the price level and reduced the competitiveness of Indian as well as Swiss products. In order to sustain their lead, Indian manufacturers are increasingly emphasizing the importance of efficient and effective production in compliance with international standards." "Acknowledging these challenges producers in all industrial sectors are continuously striving to improve and upgrade production processes. We, being now in India will be helping to overcome these challenges by using SRM’s legacy of producing excellence at RS India,” he added.